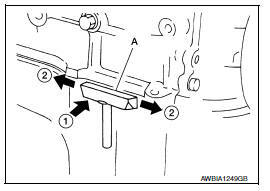 Remove oil pan (lower) bolts in reverse order as shown. Disregard the numerical order No.7 and 11 in removal. Insert Tool between oil pan (upper) and oil pan (lower). Do not insert a screwdriver. This damages the mating surfaces. Slide Tool by tapping on the side of Tool (A) using a plastic hammer. Use a suitable tool (A) to remove old liquid gasket from mating surfaces. Also remove old liquid gasket from mating surface of oil pan (upper). Remove old liquid gasket from the bolt holes and threads. Do not scratch or damage the mating surface when cleaning off old liquid gasket. Apply a continuous bead of liquid gasket (A) using suitable tool as shown as shown. Tighten bolts the No.1 and 2 in two steps. The numerical order No.7 and 11 shows the second steps. Do not reuse drain plug washer. 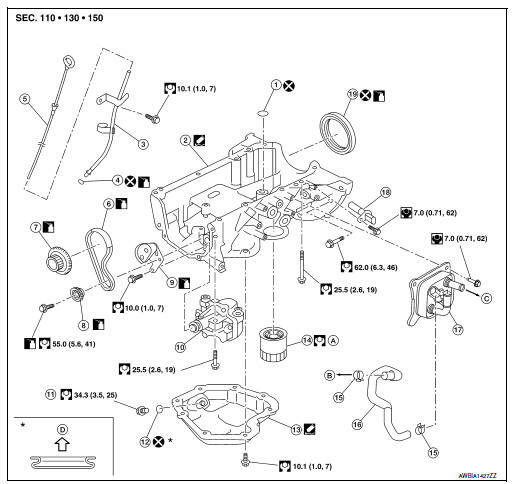 Refer to exploded view installation direction of drain plug washer. Refer to EM-33, "Exploded View". Refill the engine with engine oil. Refer to LU-9, "Refilling". Clean oil strainer if any object attached. Check the engine oil level and adjust engine oil. Refer to LU-7, "Inspection". Start engine, and check for leaks of engine oil. Check the engine oil level again. Refer to LU-7, "Inspection". Remove the engine and transaxle assembly. Refer to EM-82, "M/T : Exploded View" (M/T) or EM-86, "CVT : Exploded View" (CVT). Remove the clutch cover and clutch disc. Refer to CL-17, "Exploded View". Remove the flywheel (M/T) or drive plate (CVT). Refer to EM-90, "Exploded View" (M/T) or EM-92, "Exploded View" (CVT). Mount the engine on an engine stand. Refer to EM-72, "Removal and Installation". Remove the generator and generator bracket. Refer to CHG-29, "Exploded View". Remove oil pan (lower). Refer to EM-33, "Removal and Installation (Lower Oil Pan)". Remove oil filter. Refer to LU-10, "Removal and Installation". Remove oil level gauge and oil level gauge guide. Remove oil pump if necessary. Refer to LU-12, "Exploded View". 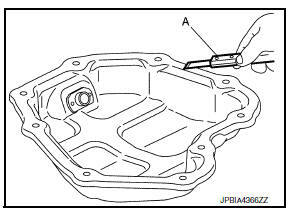 The oil pan (upper) can be removed and installed without removing the oil pump. 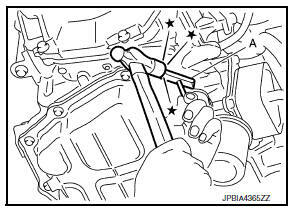 Using suitable tool as shown by the arrow ( ) open up a crack between oil pan (upper) and cylinder block. 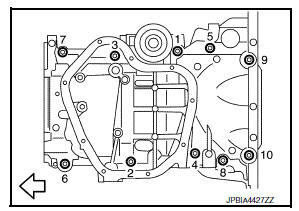 Insert Tool (A) between oil pan (upper) and cylinder block. 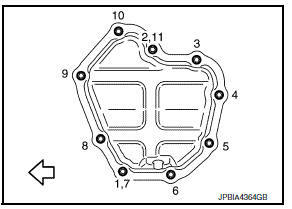 Remove O-ring between cylinder block and oil pan (upper). Remove the old liquid gasket from mating surface of cylinder block. Do not scratch or damage the mating surfaces when cleaning off old liquid gasket. Apply a continuous bead of liquid gasket (D) using suitable tool as shown. Installation should be done with 5 minutes after applying liquid gasket. Install new O-ring at cylinder block side. Install avoiding misalignment of O-ring. 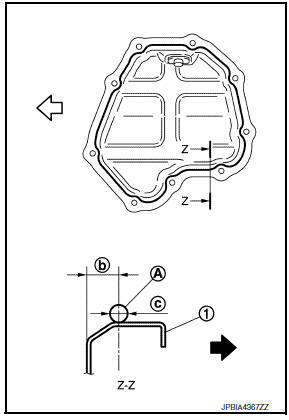 The installation of rear oil seal should be completed within 5 minutes after installing oil pan (upper). Always replace rear oil seal with new one. Do not touch oil seal lip. Do not reuse rear oil seal. Wipe off liquid gasket protruding to the rear oil seal mounting part of oil pan (upper) and cylinder block using suitable tool. Apply engine oil to entire outside area of rear oil seal. Press-fit the rear oil seal using a suitable drift (A) with outer diameter 115 mm (4.53 in) and inner diameter 90 mm (3.54 in). Press-fit to the specified dimensions as shown. Do not touch the grease applied to the oil seal lip. Be careful not to damage the rear oil seal mounting part of oil pan (upper) and cylinder block or the crankshaft. Press-fit straight, checking that rear oil seal does not curl or tilt. 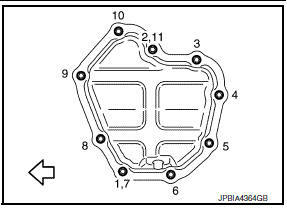 The standard surface of the dimension is the rear end surface of cylinder block. Before starting engine, check oil/fluid levels including engine coolant and engine oil. If there is less than required quantity, fill to the specified level. Refer to MA-11, "Fluids and Lubricants". Turn ignition switch ON (with engine stopped). With fuel pressure applied to fuel piping, check for fuel leakage at connection points. Warm up engine thoroughly to make sure there is no leakage of fuel, exhaust gas, or any oils/fluids including engine oil and engine coolant. Bleed air from passages in lines and hoses, such as in cooling system. After cooling down engine, again check oil/fluid levels including engine oil and engine coolant. Refill to specified level, if necessary. *Power steering fluid, brake fluid, etc. Clean oil strainer portion (part of the oil pump) if any object attached.